Reporting from London, Carole Reckinger follows a refugee’s journey through the maze of bureaucracy, haphazard decision-making, and ‘immigration and removal centres’. Illustrated by Catherine Lemaire. “Do you think I am a dangerous man and a threat to society?”, Mohammed* asks me with a pleading look. “I do everything the Home Office asks me to do, and they treat me like a criminal.” Mohammed was the first person I met when I started doing weekly visits as a volunteer to immigration and removal centres in London in 2007. I have been following his Odyssey in the asylum system for the past six years. A total of 36 months locked up in detention, numerous promises of papers, threats and uncertainty, and still no legal status. I liked the shy Algerian with his sad but sparkling eyes from the first time I met him, in the sterile detention visitors’ room in Colnbrook immigration and removal centre outside Heathrow airport. He looked much older than his late twenties, his facial features bearing witness to the hardships he had endured. Although he had been in the UK for over a year and a half, he did not speak English and had not yet seen any of the famous British landmarks and beautiful landscapes. All he could see were the planes landing and departing from Heathrow, and the wall placed a few metres in front of the bedroom window he shared with another detainee. His roommates changed frequently as they were either deported back to their countries or released. Mohammed, however, stayed on. I was the first person to visit him since his ordeal began more than 18 months earlier, and I was, for a long time, the only contact he had with the ‘outside’ world. Mohammed always asked me to describe what London and England look like, what it smells like, what people do in their daily lives. He tried to recreate a normal atmosphere, to forget about his ordeal for a short moment. Every time, he would insist on paying for the watery instant coffee from the vending machine for both of us, though he received only a few pennies a day to buy essentials such as soap and toothpaste. He was always concerned about me wasting too much time travelling from central London to see him, and never asked for anything. He clearly tried to be in a good mood, not to get carried away by sadness or depression, and spoke very little about his monotonous life in the detention centre. Each time, he hoped it would be my last visit, and that he would be released or sent back to Algeria. Mohammed’s asylum claim had been refused and he was cooperating with the return process, but the Algerian embassy refused to issue him with a travel document. The Algerian authorities did not recognise him as an Algerian national, whereas the Home Office was determined to deport him back to Algeria. Even after years of friendship, I never found out why Mohammed had left Algeria in the first place, and I decided that I do not need to know. The story he told me started in Switzerland, where he had lived illegally for a few years after fleeing from Algeria in his late teens. Life was hard, and the soft-spoken Mohammed had trouble earning enough money to buy food or to rent a room. One day a friend told him that life in the United Kingdom was much better, and jobs easier to find. Without asking anyone else for an opinion, he decided to take his chance, believing that life could not possibly become any more difficult. After paying for a fake passport on the black market and arranging transport to England, he left full of hope for a better future. “I had to smile when I walked up to passport control, as I knew that my passport was fake, and quite honestly of a bad quality,” he tells me with a sad smile. “I had no idea what would happen to me. I applied for asylum but was nonetheless put in prison for entering the United Kingdom with fake papers. After I served my eight months sentence, I was put in Colnbrook immigration and removal centre pending deportation”. More and more people are being detained for years, the UK being one of the few countries in the world that does not have a time limit on depriving people of their freedom. People are detained indefinitely by the UK Border Agency when they cannot return to countries like Somalia or Zimbabwe – which are deemed too dangerous – or because they do not possess a passport. Research has shown that almost half of people detained for over a year are from four countries: Algeria, Iran, Iraq and Somalia. These countries are ‘systematically unwilling’ to recognise detainees as citizens and are not interested in re-documenting them overseas. Under the 1971 Immigration Act, detainees can only be held if deportation is expected to take place within a ‘reasonable’ period – with ‘reasonable’ not being defined. Increasingly lengthy periods of administrative detention are becoming accepted as the norm, and indefinite detention is believed to have significantly increased in recent years. Although Mohammed cooperated to obtain new travel documents and was willing to go back home to Algeria, he remained in a state of limbo. The Home Office’s statement that detention is for a ‘reasonable period’ turned out to be a long nightmare for Mohammed. After 22 months in detention, a High Court ruling determined that his detention was unlawful, given that there was no prospect of his removal to Algeria within a ‘reasonable’ time frame. He was released, but this was not the end of his Odyssey. Mohammed was free for about two years, he learnt English and made plans for his future. This short period of freedom was abruptly aborted when the Home Office decided that as he does not have family or children in the UK, and because the situation in Algeria is safe, he will need to go back ‘home’. And the whole debacle started from the beginning. Unsurprisingly, Algeria still did not want Mohammed back. What followed was a further 14 months locked up in detention. He was released another time. In September this year, he received a letter from the Home Office telling him to apply for asylum again or he will be sent back to Algeria. Once more. It seems never-ending. The most difficult visits would come after Mohammed had received yet another refusal to his bail applications. Those times he was quiet, sad or showed anger. “I am not a criminal, I am a human being, I do everything they ask me to do, and I am treated like an animal,” he blurted out one day. Almost anyone who is detained under Immigration Act powers can apply to the Asylum and Immigration Tribunal for bail, usually under certain conditions. Asylum detainees who are granted bail can live outside detention while they wait for their immigration case to be resolved. Mohammed applied every 28 days for bail, but his claim was continuously rejected. “My roommate read my bail rejection papers one day and asked when and why I had beaten up two guards. Which two guards, I asked surprisedly? I have never harmed anyone. They had lied on the form, and not even cleverly, as they put down the wrong removal centre. I complained and they removed this from my form, but without apologising,” Mohammed explains. During moments of desperation, he talked about the emotional strain of being locked up and not knowing when or if he would ever be free again. “Prison was a better place,” he told me one day. “At least I knew why I was there and exactly for how long. Here I don’t know why they keep me. I paid for my crimes. I can’t even go back to my country. Life is very difficult there for me, but I have decided that it is better to die a free man than to be locked up. But even this I am refused now. My life is over. I am young. I should be able to work, to make a living and to have a family. Instead I am locked up in here, with nothing to do and no hope for the future.” In moments like this, I found no words to console him. For the moment Mohammed is free. He works and has a new dream to become a teacher one day. The letter in September telling him to start the procedure from the beginning came like a bombshell. “I am scared I will lose my freedom again, and will have to go back to detention. They treat me like a dangerous man, I wouldn’t hurt a fly! 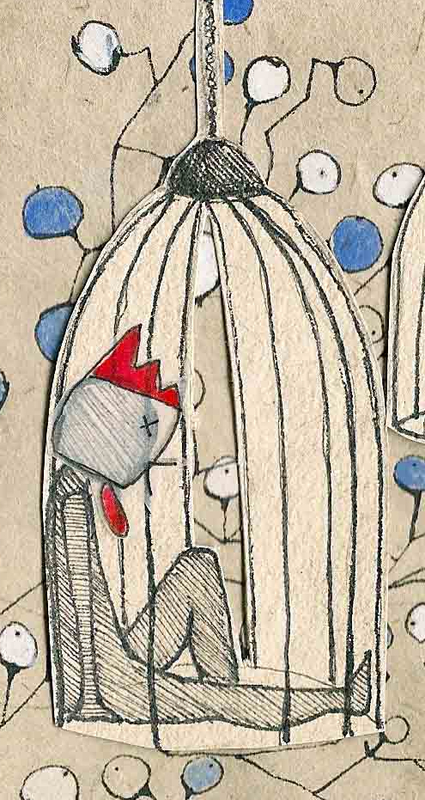 If they lock me up one more time, my life is over… Europe always talks about Human Rights. Why are they not respecting my human rights, and those of all the other people who are in a similar situation?” he asked me the last time we met. I did not know how or what to respond. Carole Reckinger is a journalist, photographer, researcher and international peaceworker. Co-director of Bitter Oranges. She has just returned from Cebu Island, the Philippines, where she coordinated aid work on behalf of Caritas Luxembourg following the Haiyan typhoon. 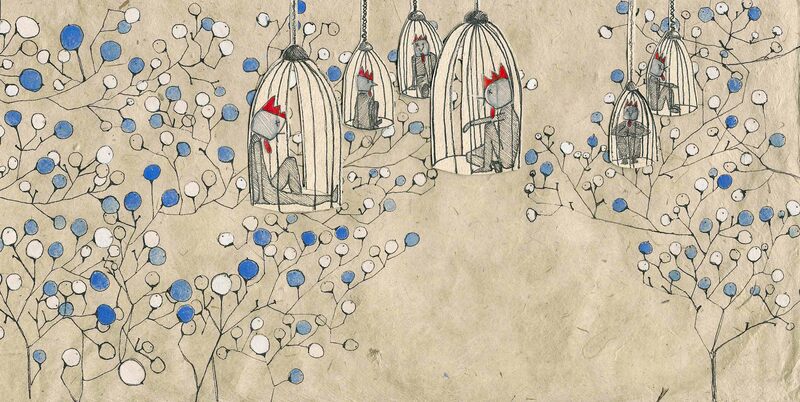 Catherine Lemaire is a visual artist based in Barcelona, Spain. She graduated from the University of Brighton in 2007. 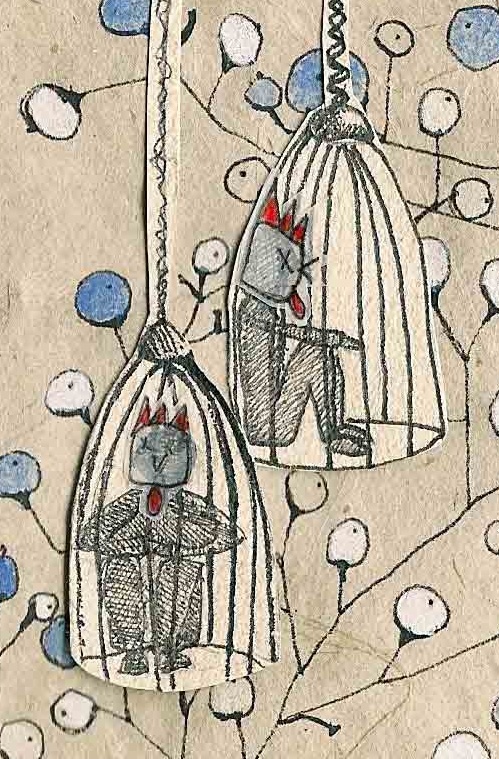 She works as a painter, illustrator and artist book creator. She has exhibited in Belgium, France and Spain and is currently working on different illustration projects. 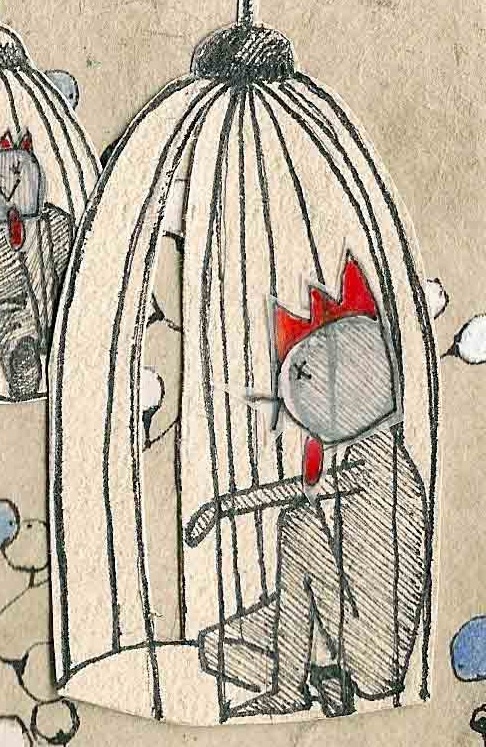 This entry was posted on 18/12/2013 by mondepasrondeditor in illustration, journalism, visual art and tagged asylum, Carole Reckinger, Catherine Lemaire, detention, migration, UK.